>SNL: There are "Lots of Openings!" 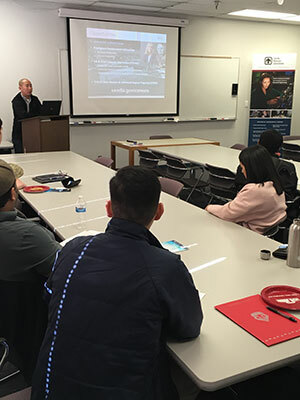 Our friends from Sandia National Laboratories (SNL) visited ECE on Thurs, Jan 24 to deliver a lecture and to tell us about job opportunities that await our graduates. The workshop was attended by two dozen students from ECE who feasted on pizza prior to the lecture. Students also got a chance to grab colorful lanyards and beautifully-bound notebooks that were generously provided by SNL. The workshop was kicked off by Dr Calvin Chan, Principle Research Scientist and Engineer at SNL. His talk was entitled "PUF or FLUFF? Considerations for Using Physical Unclonable Functions." Following the lecture, we were introduced to Diane Peebles, who works at Sandia National Laboratories and acts as a liason between the major New Mexico Universities and The Labs. "There are a lot of openings [at Sandia]!" said Peebles. "Computer Engineering and cybersecurity are critical jobs needs for us." Peebles has her very own office in room 2091 at the Centennial Engineering Building (that big structure just west of ECE). Peebles occupies this office from 8 am to 5 pm every Thursday and she would be delighted to field questions from students who might be interested in finding a job at The Labs.